You'll receive this quest from Tautanu in the Black Hammer Smithery in Gilded Vale. Tautanu will tell you that his wares are currently limited because his latest shipment of supplies is late in arriving. If you ask him for details, then he'll go on to say that his workers probably cut through Black Meadow on their way back from Loghome, and that you should look for them there. 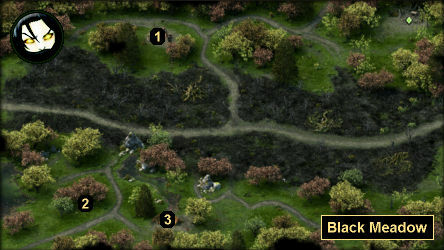 When you reach Black Meadow, you'll discover a bandit camp in the northern part of the map (#1). The bandits will be bragging about their "haul" today, and they'll send one guy out to scout the road to the north. If you wait for the scout to move away from the camp, then you should be able to fight him without the other bandits noticing, and split up the fight into two parts. When you loot the camp, you'll find Tautanu's Shipment Crate in one of the crates by the fire. Note: You'll also find a Tattered Note in the bandit camp. The note will mention a fence in Ondra's Gift, but there isn't any way to deliver Tautanu's crate to him. Before leaving Black Meadow, you should head south and take a look at the cart that once held Tautanu's supplies (#2). You won't find anything there, but not far to the east you'll discover a ransacked camp with two dead bodies next to it (#3), and those might be Tautanu's men. When you return the crate to Tautanu, you'll get all sorts of nice rewards. Tautanu will give you the Larder Door and 100 cp, he'll add several fine items to his stock, and he'll reduce his sell prices by 15%. You'll also earn a "major" reputation bonus with Gilded Vale.